This Perfect Pound Cake Recipe is a recipe I know I’ll be using again and again… and I hope you will too! Rich and flavorful with a light and buttery texture that simply melts in your mouth! 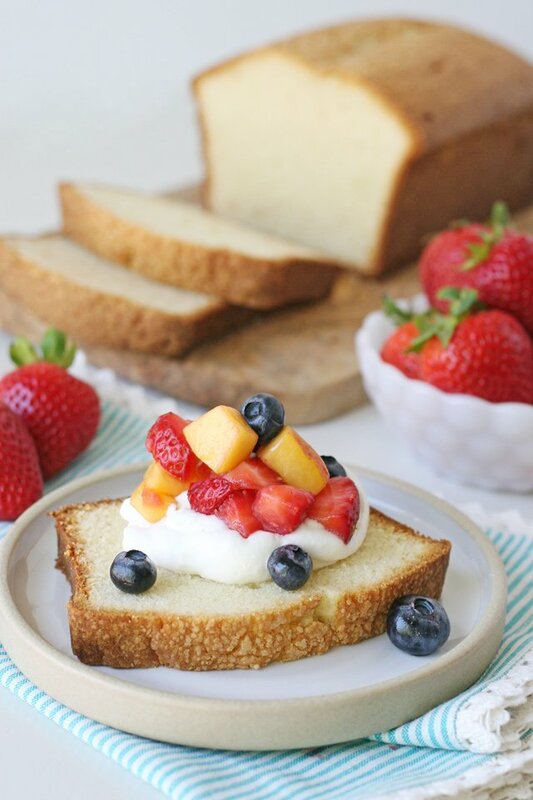 This Pound Cake is delicious on its own, and is also a perfect base for an almost endless array of toppings! This post was created in partnership with Challenge Dairy. I love when simple ingredients can be used to create amazing results! This perfect pound cake recipe is a treat you can likely make without a special trip to the store! Yay! As long as you keep good quality butter on hand, you’ll be good to go! I use Challenge Butter in all of my baking because I know I can depend on Challenge for fresh flavor and consistent results. If you’re not sure where to find Challenge Butter in your area, be sure to use this helpful map. Pound cake on its own is not exactly the most “showy” dessert. It looks pretty simple and plain. 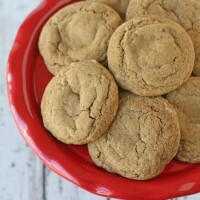 But let me assure you… this recipe won my heart! This humble cake is rich and flavorful and the texture is simply perfect… dense enough to slice perfectly, with a beautifully delicate crumb. This pound cake is truly perfect all on its own… especially with a nice cup of coffee or tea, but feel free to dress it up too! I topped this cake with fresh whipped cream and fruit (strawberries, blueberries and peaches) for a beautiful dessert that’s perfect for summer entertaining. Feel free to play around with various toppings throughout the seasons… spiced apples and caramel sauce would be amazing, strawberries and chocolate sauce would be gorgeous, and tropical fruit with coconut would be delicious! 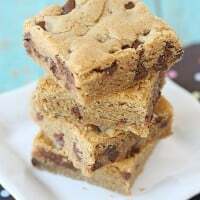 Rich, flavorful and just melt-in-your-mouth delicious! Simply perfect on its own, or get creative with all kinds of delicious toppings! Prepare a 9"x 5" loaf pan by lightly coating with butter, then sprinkle with flour, and tap out any excess. In a medium sized bowl combine the flour, baking powder and salt and set aside. In the bowl of an electric mixer, beat butter until smooth. Add sugar and beat for a good 2-3 minutes until very light and fluffy. Do not skimp on this step. Add eggs, one at a time, blending for at least 10-15 seconds between each egg. While slowly mixing, add the flour mixture. Blend just until combined. Once all the flour has been added, pour in the milk and blend just until all the ingredients are well incorporated. The batter should be thick and smooth. Pour/scoop the batter into the prepared pan, and smooth the top as needed. Bake for 60-75 minutes, or until the loaf is deep golden brown and a toothpick inserted in the center comes out clean. Be patient, and make sure the loaf is fully baked. Baking time will vary based on your loaf pan and oven. Cool loaf in the pan for 20 minutes, then gently remove from pan and allow to cool fully. Serve immediately or wrap up and keep well wrapped (or in a tupperware type container) at room temperature for up to 5 days. This cake will remain fresh and delicious for several days (up to 5) stored wrapped, at room temperature. The cake also freezes well. Wrap cake well and freeze for up to 3 months. Thaw at room temperature, while still wrapped. This recipe can be doubled to fill a standard bundt cake pan. You will need to increase the baking time. 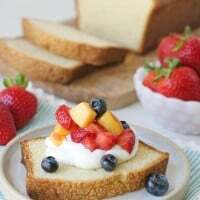 For the cake pictured, simply top with fresh whipped cream and summer fruit. I used strawberries, blueberries and peaches. Whipped cream - 1 cup heavy cream, 1/4 cup powdered sugar, 1/2 teaspoon vanilla. Whip cream in a cold mixing bowl until it begins to thicken. Slowly added powdered sugar, then vanilla and beat until stiff. Enjoy immediately, or refrigerate up to 3 hours before serving. 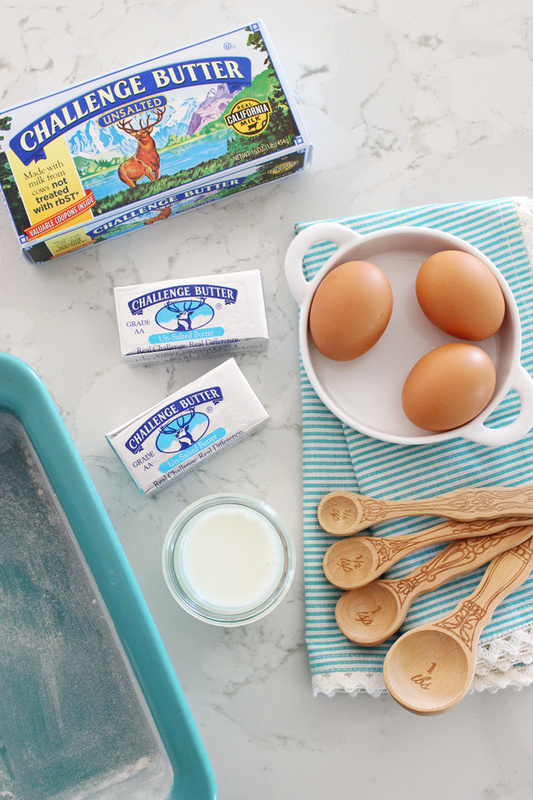 Disclosure – I created this recipe as part of an ongoing partnership with Challenge Dairy. Partnering with brands I love allows me to provide you high quality content at no cost to you. I only work with brands I use and love. All images, text and opinions are my own. 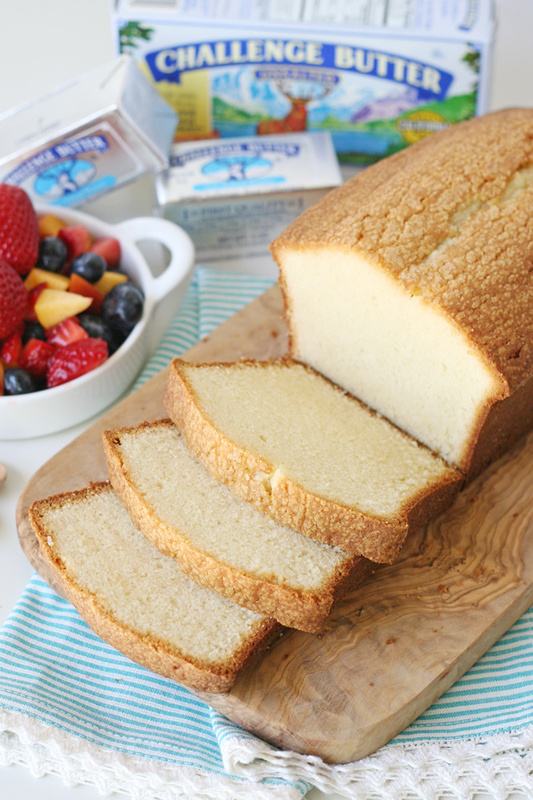 I love a good pound cake – it’s the perfect treat next to a coffee cup. Looks so delicious and moist! Thanks so much! Yes, it really is the perfect coffee time treat! 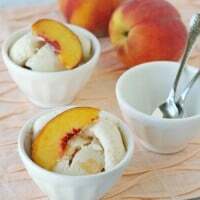 This looks so yummy and perfect for a nice summer dessert! I was just thinking pound cake would be delicious right about now and look what you provided! Thanks so much Sherrill! I hope you give it a try and love it as much as I do! I was looking for the perfect recipe! I have to try it! Looks so delicious! Thanks Kiana! I was actually surprised by how much I loved this cake! I hope you give it a try! Help?? I can’t see the milk measurement ?? 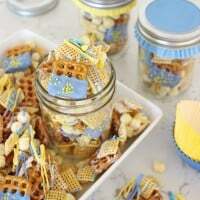 Please cld u tell me how much to put in!, looks a fab recipe and I want to make it! Many thanks. Oh goodness, I’m sorry about that! Good eye! I’ve updated the recipe now. You’ll need 1/3 cup of milk (any fat content will work). Happy baking! I can’t wait to try this! I have NOT had good luck with making pound cakes. LOL. But this looks perfect!